Vegan actor Thandie Newton has joined a major campaign calling for an end to the foie gras industry. Together with Dev Patel - famous for his roles in Slumdog Millionaire and Skins - she joined the initiative led by animal protection organization Animal Equality. More than 100,000 people have signed the group's petition demanding an import ban on foie gras following Brexit. These signatures will be delivered to Downing Street tomorrow (September 18) by vegan actor and animal advocate Peter Egan. Animal Equality has documented the suffering of ducks and geese on foie gras farms across France and Spain where birds are force-fed huge amounts of food to produce engorged fatty livers. According to the organization: "This process is so cruel that it is illegal in the UK, yet nearly 200 tonnes of foie gras is still imported every year for shops such as Harrods and Fortnum & Mason as well as opulent restaurants." 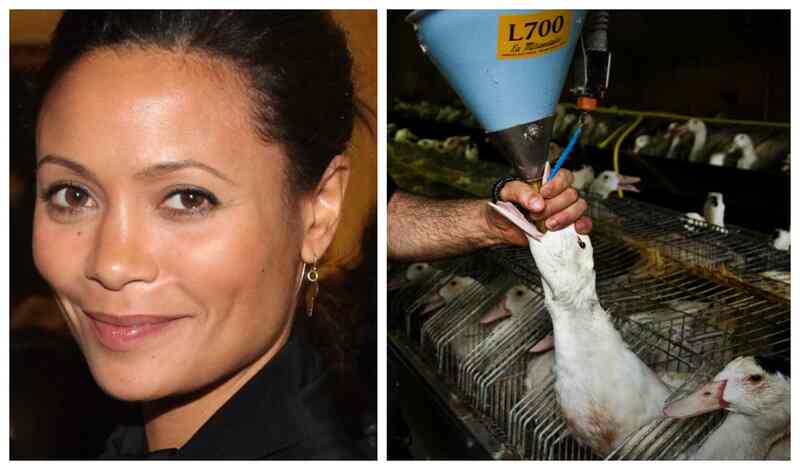 After viewing footage of birds being force-fed for foie gras, Thandie Newton said: "I am pleased to join Animal Equality UK and the overwhelming majority who support a #FoieGrasFreeGB. "The UK's departure from the European Union allows the unique opportunity for Parliament to meaningfully depart from the grotesque foie gras industry. "The law should reflect that if it’s too cruel to produce here, we shouldn’t welcome cruelty from elsewhere." Dev Patel added: "As so many undercover investigations reveal, foie gras production causes prolonged suffering to birds who are repeatedly force-fed by having metal rods shoved down their throats until their livers swell to more than 10 times their natural size. "The process is so exceptionally cruel that foie gras production was made illegal in the UK, yet the sale and importation of it is still allowed. We refuse to tolerate this loophole." Comedian Ricky Gervais, naturalists Chris Packham and Bill Oddie, and actors Evanna Lynch, Joanna Lumley and Steven Berkoff have also spoken out in support of the campaign.